Seiko never neglects the demands of loyal Seiko enthusiasts all around the globe. 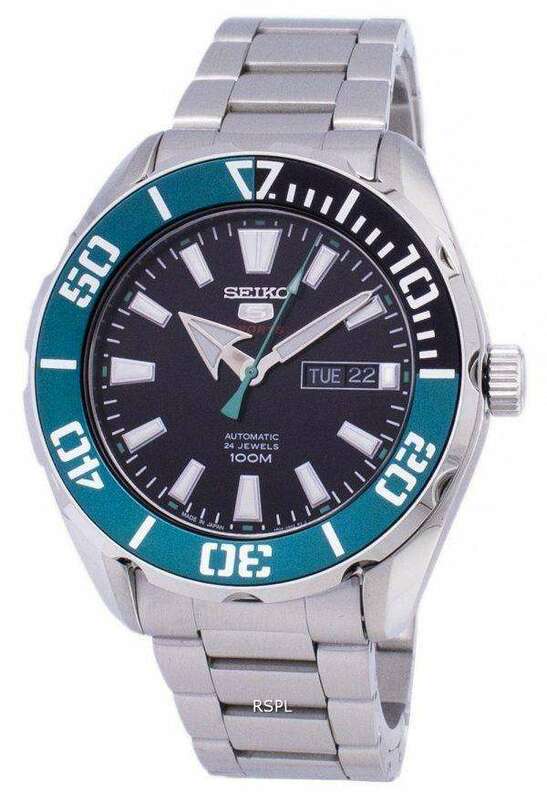 The Seiko 5 Sports Automatic Japan Made SRPC53 SRPC53J1 SRPC53J Men’s Watch is the kind of watch that define diver watches that also double-up as high-street fashion elements, only that it is particularly robust and at the same time, attainable. The Seiko 5 Sports Automatic Japan Made SRPC53 SRPC53J1 SRPC53J Men’s Watch stands apart from the usual, dizzying array of sports watches that over time have turned into legends and continue to work through decades after they were produced. The Seiko 5 Sports Automatic Japan Made SRPC53 SRPC53J1 SRPC53J Men’s Watch bears a lot of resemblance with the Monster - the first among the most popular modern dive watches by Seiko. Only that it’s less chunky and can be worn in the social context rather than just on the beach or in the waters. It has a classic shape that comes with the typical Seiko flair and every inherent quality of the archetypal Seiko diver with a reliability that’s often missing from the affordable price bracket. The teal bezel, apart from appearing cool and bright on the streets is a privilege when you are amidst a turbid surrounding; it’s bright enough to single you out visually from the rest. It is a functional bezel, which is, it doubles up as a timer that counts down time till 60 minutes. And that could be the time shown on the parking meter; not just when you are in a dive. The bezel is concave in its shape, which is an added protection for the mineral glass covering its face. Even if your watch bangs head-on with a hard, flat surface, the edge of the bezels will keep that shock away from the glass. There’s nothing much to be told about its diver qualities in particular. Being a Seiko, it fulfills all criteria that have made Seiko a prominent name in the Diver circle; especially, the lume that glows like a torch! The large, block indices and wide hands makes for maximum visibility and the day/date complication adds a bit of daily functionality amidst all that sports features. Inside the case of the Automatic Japan Made SRPC53 SRPC53J1 SRPC53J Men’s Watch beats a 24 jewels 4R36 movement at 21600 bph and stores a full 41 hour of power reserve on a fully wound mainspring. Unregulated, it can fluctuate as much as 15 seconds a day; with a proper hairspring adjustment, it performs close to any of the higher quality luxury movements from the brand. All in all, a quality watch with a retro-cool look, the all steel construction of the Seiko 5 Sports Limited Edition Automatic Men’s Watch is here to recreate an entire new generation of dive watch enthusiasts and present the age-old fans with a fresh, new twist. Bottom line: Seiko Mens Watch attempts to offer high-end pieces through low-end prices brought forth the Seiko 5 Sports Automatic Japan Made SRPC53 SRPC53J1 SRPC53J Men’s Watch. With a movement and a design that reminds of the brand’s glorious Monster, this handsome piece pays homage to the essential Seiko diver watch spirit.